This photo album is a good example of a lack of provenance. Provenance is a fundamental principle in archives and refers to the items origin, who created it. This photo album lacks this information. The album also illustrates how even a brief description can help identify a photos subject. Some of the photos have captions but many lack any information on the subject. Given the changes to Canberra over the subsequent 93 years it makes it virtually impossible to positively identify some of scenes. Some of the locations are immediately recognisable even if they have not been labelled. 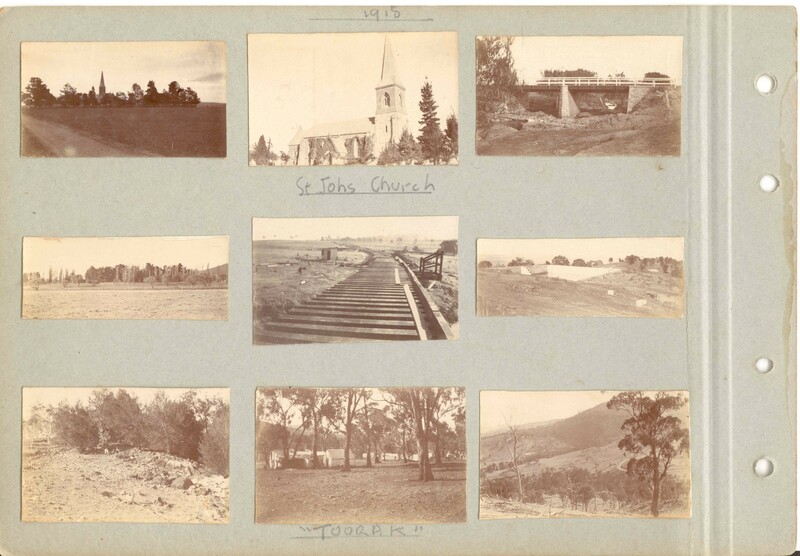 For example the first two photos are clearly of St John's Church in what is now the suburb of Reid. However as most of the photos are unlabelled it can be difficult to know exactly who or what we are looking at. The photo top right has been identified as the bridge over Woolshed Creek. Many thanks to Tim the Yowie Man for identifying this photo (10/08/2011). Here is the same scene taken 18th September 2011. The central photo in this set shows the Civic railway line under construction. This appears to be the northern end of the railway bridge that spanned the Molonglo River. The line continued through what is now Campbell and ran behind St John's Church, through Glebe Park, then into Braddon. This line fell into disuse after the rail bridge crossing the Molonglo was washed away in the 1922 floods. The next photo appears to be a water tank looking similar to that constructed for the Molonglo Internment Camp in 1918. This tank is still visible behind the Fyshwick Telephone Exchange. Due to the lack of identifying features in the photo it could just as easily be either of the uncovered rectangular reservoirs constructed in 1914 at Mt Stromlo or Upper Red Hill. The bottom three photos illustrate the value of labelling photos. The outer two photos could be anywhere around the ACT. The middle is labelled 'Toorak' which was the name given to a workmens camp where ADFA is now located. 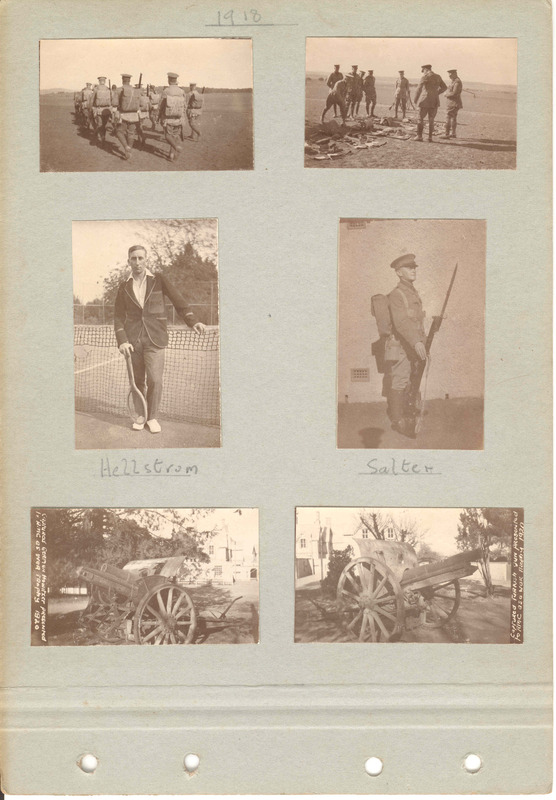 The first two photos clearly show some form of military exercise followed by portraits of Hellstrom and Salter. According to the book 'Duntroon : A History of the Royal Military College of Australia 1911-2001' these cadets are A.H. Helstrom who graduated in 1921 (1) and G.J. Salter who graduated in 1923 (2). The last two photos are the captured enemy cannons that appear to be in front of Duntroon house in these photos. These cannons are currently located at the Fairbairn Avenue entrance to RMC. Note how the captions on these two photos has a conflicting year, 1920, to that written on the top of the page. The first photo on this page, possibly of a cadets room, has a clue in the wall calender 'Sunday 31'. This would mean the photo was taken on the 31st of March 1918, the only day that a Sunday fell on the 31st day of the month that year. The next photo is General Bridges grave which is still located on General Bridges Drive in Duntroon. Tharwa Bridge is the subject in the third photo. Note the original timber piers that have been since replaced with concrete piers. 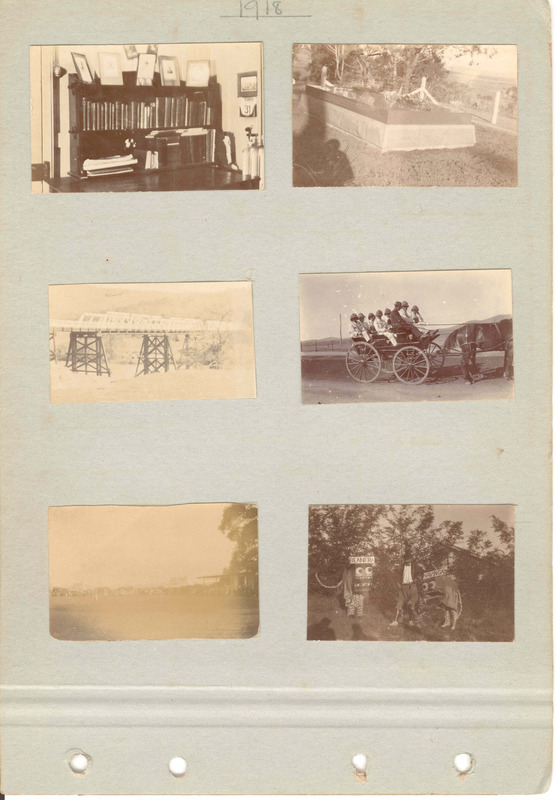 The last three photos appear to be RMC related activities - travelling around the Canberra district, a cricket match -possibly one of two matches RMC played against M.A. Noble's team and cadets dressed for some type of play. Once again the lack of information makes accurate identification impossible.